Meet Brisbane’s 10 BEST Mechanics of 2018! Let’s face it, most us don’t know everything there is to know about our cars mechanical well-being, and who can blame us? Becoming a fully qualified mechanic takes years of hard work and constant training. That’s why today, we’re here to recognise the Top Mechanics in Brisbane. In 2018, AutoGuru partner mechanics in Brisbane quoted over $25 million worth of services and repairs for AutoGuru customers, to help them better care for their cars. 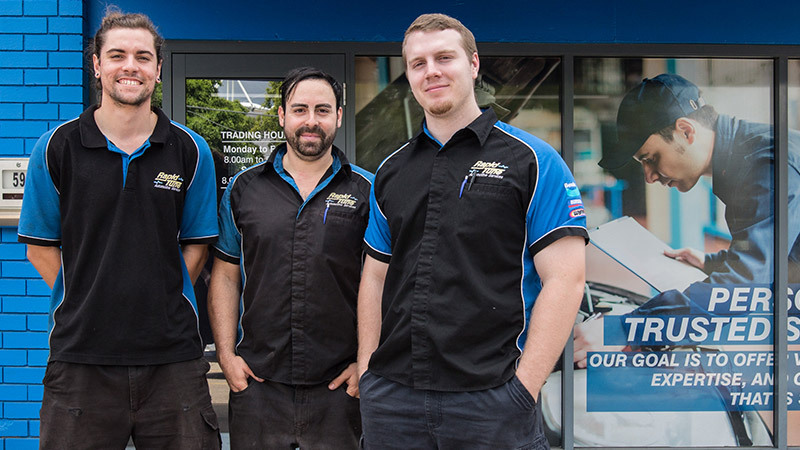 We’re here to recognise the Top Mechanics in Brisbane, who went above and beyond to consistently deliver amazing service experiences to their customers. AutoGuru would like to extend a huge congratulations to Jesse Learmonth and the epic team at Rapid Tune East Brisbane for coming in at #1 on our Top 10 Mechanics in Brisbane list! The passionate, friendly and fully qualified mechanics of Rapid Tune East Brisbane are always there to help. They are mechanical and brake experts and offer a complete range of automotive services for all types of car servicing and repairs. After being partnered with AutoGuru for just over a year and a half, it’s great to see them take the top spot in Brisbane after a great year of hard work. With over 170 reviews and an average star rating of 4.8, we definitely think they’re well deserving of the top spot. Here’s an awesome review for the team at Rapid Tune East Brisbane. Coming into #2 is Michael Georgas and the team from Absolute Car Care in Woolloongabba. After opening their doors 17 year ago, Absolute Car Care has been a leading Brisbane-based vehicle service and repair specialist. Throughout this time, they have been focused on recruiting only the most experienced and thorough mechanics in the industry, whilst priding themselves on full transparency and great communication with customers, says owner Michael. Absolute Car Care can help you out with everything from fitting tyres, modifications, repairs, engine rebuilds and logbook services. Check out this review for Absolute Car Care. Third place is awarded to One Stop Repair Centre in Northgate. This team of top notch mechanics is headed up by Leigh Debono and has been in operation for 5 years, with over 15 years experience. One Stop Repair Centre aim to provide convenience along with quality service and repairs, and with an average star rating of 4.8, we reckon they’re doing a pretty good job of that! When you book with One Stop Repair Centre, you know you’re getting a team of professionals who offer all the experience, personal attention and knowledge you expect from a great mechanic. Have a look at this review that one very happy customer left for One Stop Repair Centre. The experts at Australian Mechanical specialise in all forms of mechanical servicing, tyres, repairs and air conditioning. On top of this, they make sure each customers is fully aware of the cost of each and every part/service, and they’ll carry out work which hasn’t been quoting and seeking approval from the customers. The team, led by Matt, is proud to offer outstanding attention to detail and possess an impressive amount of knowledge that keeps customer coming back time after time. Australian Mechanical has earnt some great reviews throughout 2018, here’s a look at one of them! Hi Tech Auto Service has been operation for over 20 years and is a local family owned business located right in the middle of Indooroopilly. The team's experience as automotive service providers shows, with an awesome 4.9 average star rating, there’s no doubt that they give customers professional and polite service. Ivan Salcedo and his team of qualified mechanics take great pride in their work which includes log book servicing, pre-purchase inspection, brakes, steering and other repairs. Take a look at this great review for Hi Tech Auto Service. Autocare Tyre and Mechanical offers professional and personalised service to suit you, whatever your needs and budget may be. Partnered with the fact that they’re some seriously honest and down to earth mechanics, it’s no surprise that they were voted into our Top 10 Mechanics in Brisbane list. Tony Donovan and then team offer vehicle servicing and repairs including log book services, clutch, brakes, suspension repairs and more! Check out this great 5-star review for Autocare Tyre and Mechanical. SVS Autocare was established in 1998 and services all popular makes and models. You can take your car SVS Autocare with confidence, because they do everything from simple tune-ups to full mechanical and electrical servicing. What does Martin O’Keane and his team value most? That’d be attention to detail, personal service, integrity, and using state of the art tech to find problems and fix them the first time. With an average of 4.8 stars and over 100 reviews, we reckon they’ve stuck to their values! Here’s an awesome review for SVS Autocare. Craig Ainsworth and his team of mechanics have been in operation for 20 years and are fuel injection experts! They specialise in everything to do with injectors, as well as all mechanical repairs and servicing for all makes and models. Added to this is air conditioning repairs, tyre services, wheel alignments and vehicle remaps. Here’s what a happy customer had to say about Caboolture Fuel Injection Automotive. What should you expect to find at Bridgestone Select Albion? Well, that’d be an extensive range of quality tyres and complete auto services. They’ve got a modern workshop with an extremely comfortable customer area, letting you relax as if you were in your lounge room! The team, led by Shane Scherf, prides themselves on providing outstanding customer service and advice. The team at Bridgestone Select Albion have maintained an impressive 4.8 average star rating from customer reviews. Take a look at one of them here. Rounding out our list of Top 10 Mechanics in Brisbane is Mechanics On Demand. This team of high-quality mechanics, with Brenden leading the way and 20 years of experience, presents itself as a one stop mechanical shop. On offer is all mechanical repairs, tyres, servicing, degreasing and wash downs. They also pride themselves on working with only premium oils and parts, to make sure your car is running as happily and smoothly as possible. Check out this 5-star review for Mechanics On Demand. All data recorded on January 31st, 2019. Looking for a mechanic in Brisbane? Compare pricing, reviews and book online at AutoGuru. AutoGuru is Australia’s largest online marketplace for booking automotive services. We’ve got a passion to remove the stress, hassle and ambiguity from booking automotive servicing and repairs, both for the mechanic and the motorist.